The senator said the Assad regime was "emboldened" by a lack of U.S. action. Republican Sen. John McCain placed blame Sunday for a suspected chemical attack -- allegedly by the Syrian government against its own citizens -- on a lack of action from the U.S., citing President Donald Trump's stated desire to pull American troops from the country. “President Trump last week signaled to the world that the United States would prematurely withdraw from Syria," McCain wrote in a statement. "Bashar Assad and his Russian and Iranian backers have heard him, and emboldened by American inaction, Assad has reportedly launched another chemical attack against innocent men, women and children." At a press conference last Tuesday, the president said the primary goal of eradicating ISIS in Syria is close to being met, and that he would like to withdraw American forces. “I want to get out," Trump said. "I want to bring our troops back home." Trump suggested that he will consult with both advisers and allies, adding that a decision would be made "in the very near future." 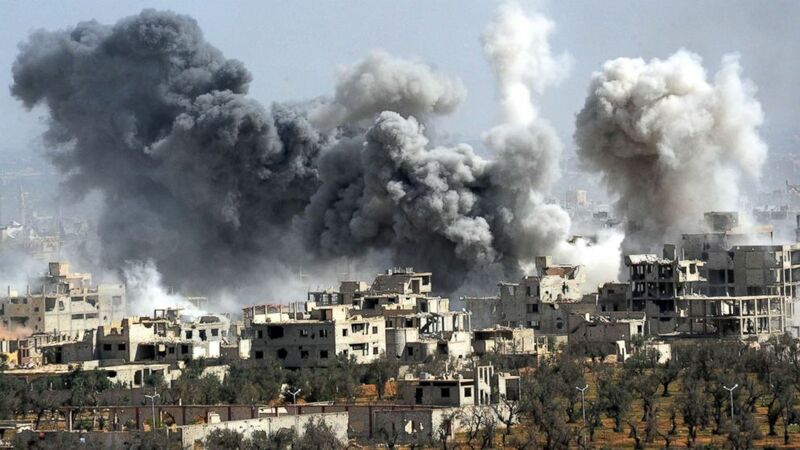 (Xinhua/Ammar Safarjalani via Newscom) Smoke rises after the Syrian army's shelling targeted the Douma district in Eastern Ghouta countryside of Damascus, Syria, April 7, 2018. On Saturday, the attack in Syria -- allegedly using chemical weapons, unleashed by the government -- occurred in Douma. The next morning, Trump blamed Russian President Vladimir Putin and Iran in a string of tweets. "President Putin, Russia and Iran are responsible for backing Animal Assad," the president tweeted. McCain addressed the comments in his statement. "President Trump was quick to call out Assad today, along with the Russian and Iranian governments, on Twitter," McCain wrote. "The question now is whether he will do anything about it." McCain went on to implore Trump to take a stronger stand against the Assad regime.